There’s no doubt that Frankfurt as an Alpha City – that’s a geographical classification of power and influence, not just poetic licence – is a vertical city that soars upwards with lofty aspirations. 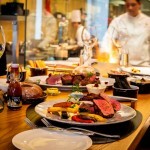 Monday to Friday, the Jumeirah Hotel’s buttoned-up business clientele, live life in the fast-lane. At 99 metres tall, the Jumeirah soars towards the stratosphere as it meets their demanding expectations. For the Jumeirah five-star facilities and service are merely the baseline. Once the working week is done weekenders heading for Frankfurt discover that the Jumeirah is the perfect location for exploring and unwinding. “Time’s money” is so very true in the bustling city that is home to both the German Stock Exchange and the European Central Bank. So, Jumeirah developed a lightening lunch for their Ember Bar: a three-in-one platter featuring starter, main and desert based on the Jumeirah’ logo of the beacon. Some days it is a mozzarella and tomato starter, sea bass on risotto and finally white chocolate mousse and soft fruits. No waiting between courses and then straight back to work. 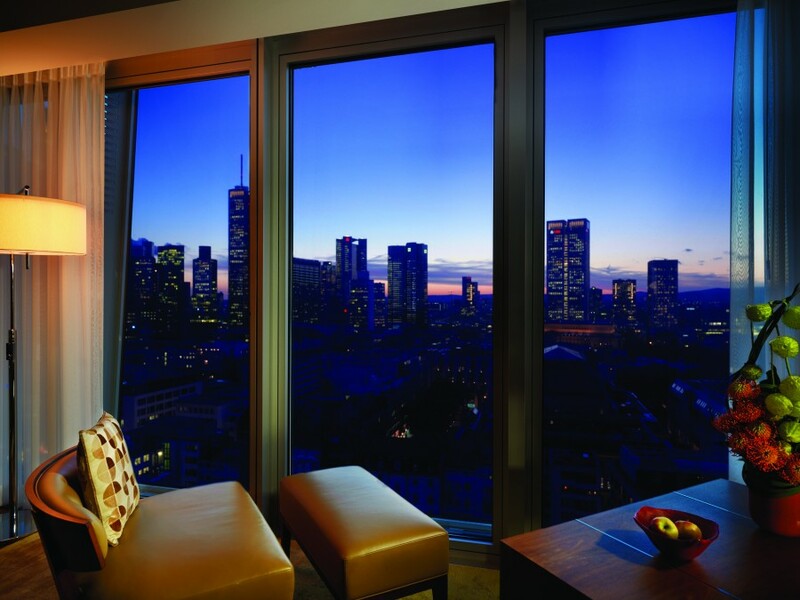 Gaze out of a floor-to-ceiling picture window in one of the Skyline Suites and you will see why Frankfurt on the River Main is nicknamed “Manhattan am Main” or “Mainhattan.” In the west of the city there is an island of skyscrapers with yet more being built. This is a dynamic city constantly developing and evolving. Those vast “smart windows” take the temperature and close the blinds if there is a danger of the sun overheating your spacious room. Another popular gizmo is a bedside button to open and close the curtains. Rooms are cutting-edge contemporary with a gentle colour palette of creams and browns rising-up from the walnut flooring. But an original work by Hartwig Ebersbach in every room, sometimes with thick oils applied with his hands or feet, brings a vibrant burst of colour to the understated decor. Jumeirah is an early adopter when it comes to technology. Using your room key on the lift control panel the software will allocate one of the five lifts for the quickest ascent or descent. In-room there are 42-inch televisions, Nespresso machines and rainfall showers. Helpfully you can charge your electrical devices whilst they are locked away in the safe. Twenty-five floors of this glass, steel and concrete construction are for the pampered guests. The 26th is reserved for 40,000 bees. Frankfurt’s botanical garden, 3 kilometres away, is a favourite destination for the bees as are the florists on Freßgass. Foraging amongst pesticide-free plants gives the bees’ honey a delicate, natural flavour. Every morning a honeycomb is presented for breakfast in the Max on One restaurant. 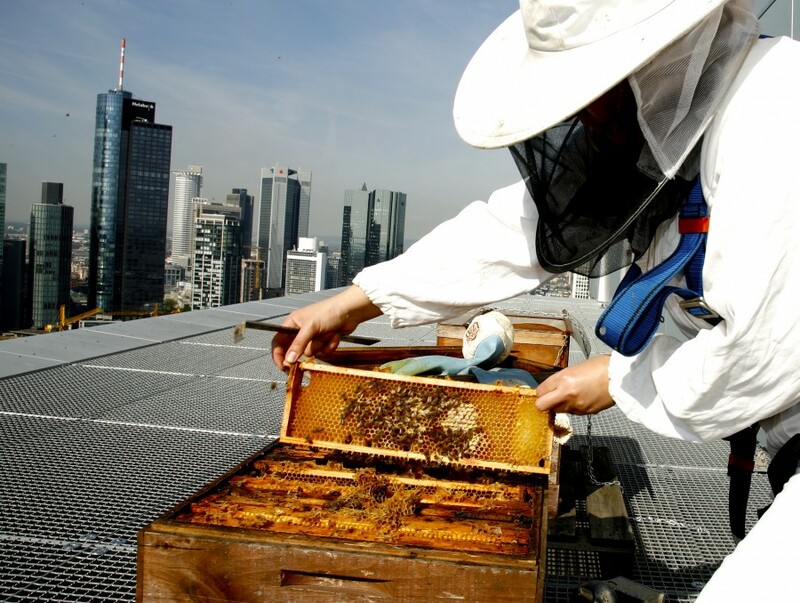 Once a week a beekeeper visits to carve out a chunk of the honeycomb and check on the bees’ well-being. Jumeirah understands that however busy your working schedule everyone needs some down-time: on Wednesday evening there’s live music in the Ember Bar. Sometimes one of the housekeeping staff takes the mic to sing blues and soul classics. 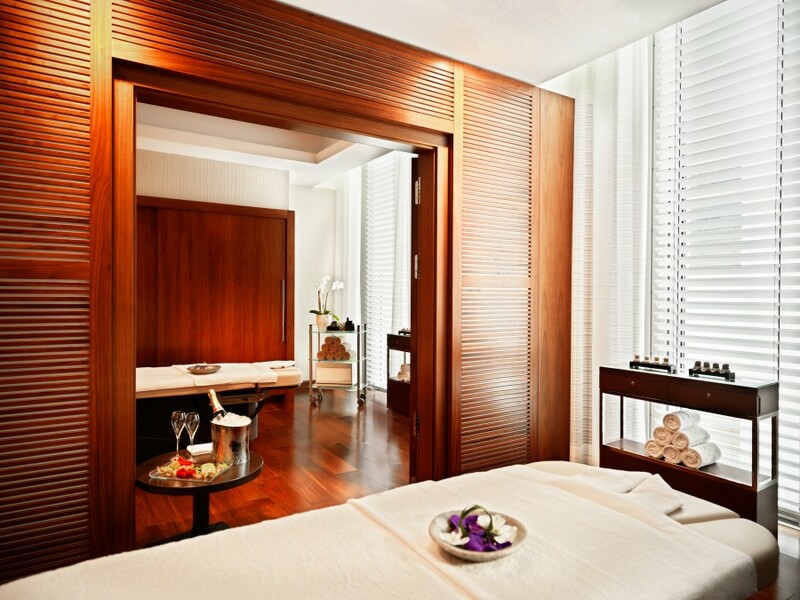 In the hotel’s serene Talise Spa the hour-long honey massage is a popular signature treatment as is the apple facial mask. Above all else the Jumeirah has location, location and location. From the airport the S8 or S9 will deliver you directly to the Hauptwache Station in around 15 minutes. Then it is just a three minute walk to the Jumeirah Hotel. The hotel connects to both the MyZiel shopping mall, currently being extended, and to a cavernous Fitness First Gym where all guests have complimentary membership. Most of Frankfurt’s attractions are within an easy stroll: there are the museums along the River Main, Frankfurt’s newly restored Old Town, Freßgass nicknamed the Gourmet Mile, the Stock Exchange and the Opera House. Rooms from around £250 per night including breakfast.